Alamo Glass & Mirror is the preferred frameless glass shower door installer of Richardson, Tx homeowners. We have taken many average looking bathrooms and turned them into a luxury spa. 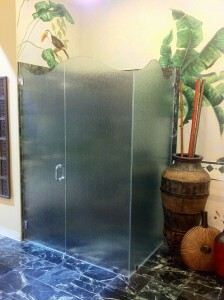 Our frameless shower doors can have 3/8″ glass or 1/2″ glass. There are many different types to choose from. The most common glass used is clear glass, however some Richardson residents prefer the look of saten glass or rain glass. Whatever glass you choose, these custom glass shower installations really compliment your bathroom. If you are remodeling your bathroom or just want a more elegant shower enclosure, please contact Alamo Glass & Mirror. We offer free in home estimates. We also have two conveniently located showrooms for Dallas and Ft Worth residents to get a hands on view of our beautiful custom glass and mirror products. Remember, call Alamo Glass & Mirror for all of your custom glass shower door needs. If you go to our Facebook page there is a “like button at teh top of the page by our name “Alamo Glass & Mirror”. If you are wanting to enter the contest for the free frameless shower enclosure, on the left side of the page there is a link labeled “contests” click on that link and you will be able to upload a picture there. Or you can Click Here and it will take you directly to the contest page. This is exactly a little something I need to do more research into, thank you for the blog post.